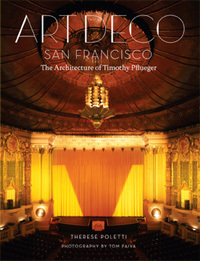 Architect Timothy Pflueger was the son of German immigrants who came to San Francisco in the late 1880s. Born in 1892, he grew up in the working class Mission District. He began his career as an architectural draftsman while many in the city rallied to rebuild San Francisco after the devastation of the earthquake and fire of 1906. Through his early office training with J.R. Miller, who later became his partner, and in classes at the San Francisco Architectural Club, Pflueger was steeped in the Beaux Arts style popular after the turn of the century. He eventually sought more exotic influences beyond Europe’s academic teachings for modern expressions of the fast-moving Jazz Age, and later more streamlined forms during the Great Depression. He designed some of the city's best-loved neighborhood movie theatres, the Castro Theatre and the Paramount Theatre in Oakland, skyscrapers including the Mayan splendor of 450 Sutter and the San Francisco Stock Exchange tower and luncheon club. During the Great Depression, public school projects, such as George Washington High School and stunning cocktail lounges like the Top of the Mark were among the firm's work. Pflueger also was chairman of the board of architects of the Bay Bridge and on the committee of architects who designed the 1939-1940 World's Fair at Treasure Island. Pflueger's Federal Building was among the most modern buildings at the fair. He also came up with the idea for "Art in Action," where muralist Diego Rivera was the star attraction, working amid other well-known local artists, forming an exhibit on the making of art at the fair. 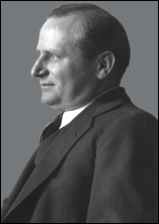 Pflueger was also the president of the San Francisco Art Association for several years and was a founding director of the museum now known as SFMOMA. In the late 1930s and through the 1940s, he also designed several I. Magnin stores for Grover Magnin, including the white marble lady that remains a focal point of Union Square today. He died of a sudden heart attack in 1946 in downtown San Francisco, near many of his buildings, at the age of 54.